Emory Law’s Center for Transactional Law and Practice marked its 10th anniversary last month by convening the first meeting of its inaugural advisory board, comprised of business and legal leaders from across the country. 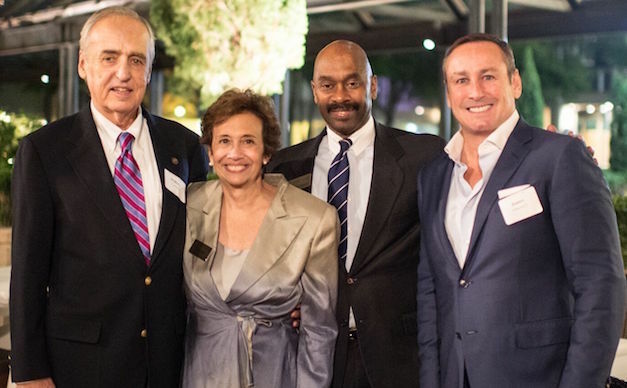 Also, an October reception hosted by Emory Law Class of 1994 alumnus Jim Albertelli and his wife, Heather, honored donors and contributors to Emory’s transactional law program, especially those who helped the law school match a recent $1 million challenge grant. Since the center established its renowned transactional law program and the Certificate in Transactional Law and Skills a decade ago, 395 students have earned the certificate. Each year, approximately 375 JDs, LLMs and JMs enroll in the signature “Doing Deals” courses the center offers. Last year, the center offered 22 sections of Contract Drafting, 11 sections of Deal Skills, and 10 capstone courses in specific disciplines such as Mergers and Acquisitions, Commercial Real Estate and IP Transactions. In 2015, Charles Howard Candler Professor of Law Emeritus William Carney and his wife Jane donated a $1 million challenge grant to the center. Alumni and other donors who support transactional law and skills education swiftly answered that challenge. With the gift matched, Carney’s goals to expand the center’s faculty by adding an assistant director and further strengthen the center by bringing on an advisory board came to fruition. Ex-officio members: Charles Howard Candler Professor of Law Emeritus William J. Carney, Assistant Director Katherine Koops, William and Jane Carney Professor of Transactional Law and Practice Sue Payne, Professor in the Practice of Law (retired) Tina Stark and attorney Mark Wasserman 86L, who is chair of Emory Law’s Advisory Board. The center’s founding director, Tina L. Stark, was honored during the Oct. 12 reception held at the St. Regis Atlanta. Stark’s vision led her to create a comprehensive, integrated curriculum that allows students with interests beyond litigation to follow a well-developed path to learn transactional law. Today, Emory’s program offers an extensive course of study that blends legal doctrine, business acumen and practical skills training. The center is also known for its biennial conferences for business law educators that typically attract about 100 law school faculty from around the country to the Emory campus. The next conference, “To Teach Is to Learn Twice: Fostering Excellence in Transactional Law and Skills Education,” will be held in June 2018. Payne and Koops also oversee the transactional law program’s negotiation teams and host the southeastern regional Transactional LawMeets® competition every other year. Emory Law’s team has taken one national championship and several regional wins since 2014. Nearly 30 local corporate lawyers serve as judges for the 12-team tourneys.